Ross's Law Marketing Blog: "Nice to meet you. 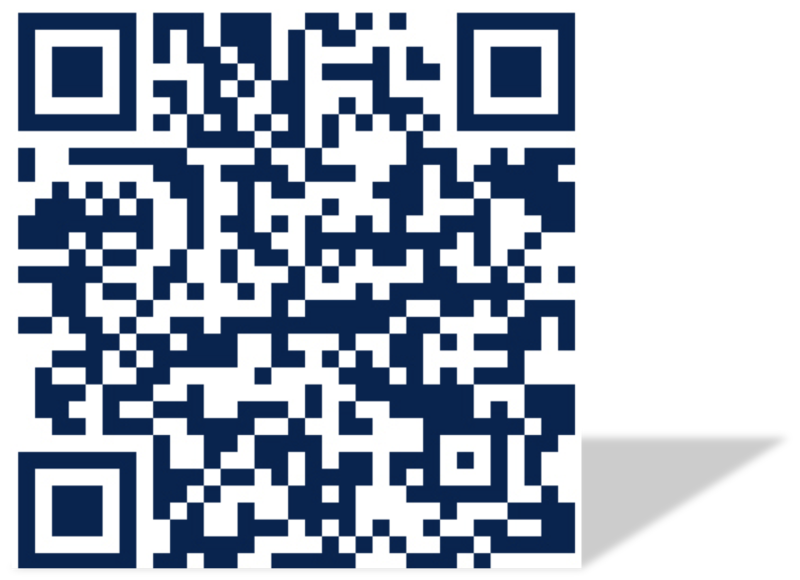 Here's my [crappy, flimsy] card." "Nice to meet you. Here's my [crappy, flimsy] card." You ever receive a business card that's on cheap paper? That feels thin and flimsy, and... wilts? We all have. Remember the subtle, subconscious feeling of disappointment? What a missed opportunity that was for them to convey their quality and prestige. First impressions matter, and for a few lousy cents per card, perhaps an extra couple bucks a year, they could have conveyed a dynamic, high-end impression to every single person and prospect they met, all year. 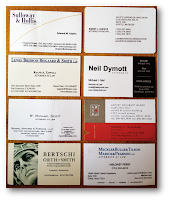 Your logo and business card are the tangible, physical embodiment of your entire law practice. If your card implicitly says "Mediocre," "Cheap," or "Boring," it's just a little bit harder to prove that you're high-quality and creative. Why take the chance? Would you trust your money to a bank that saved a few pennies on the paper on its executives' cards? 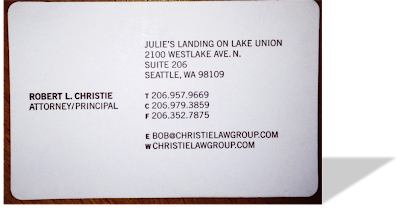 Would you hire a law firm to handle a crisis if their cards seemed to be designed by Kinko's? Maybe. But maybe not. Lawyers sell an expensive, high-risk, intangible service. Prospects can't take us for a test drive, so always they're looking for something tangible to hang their hat on. 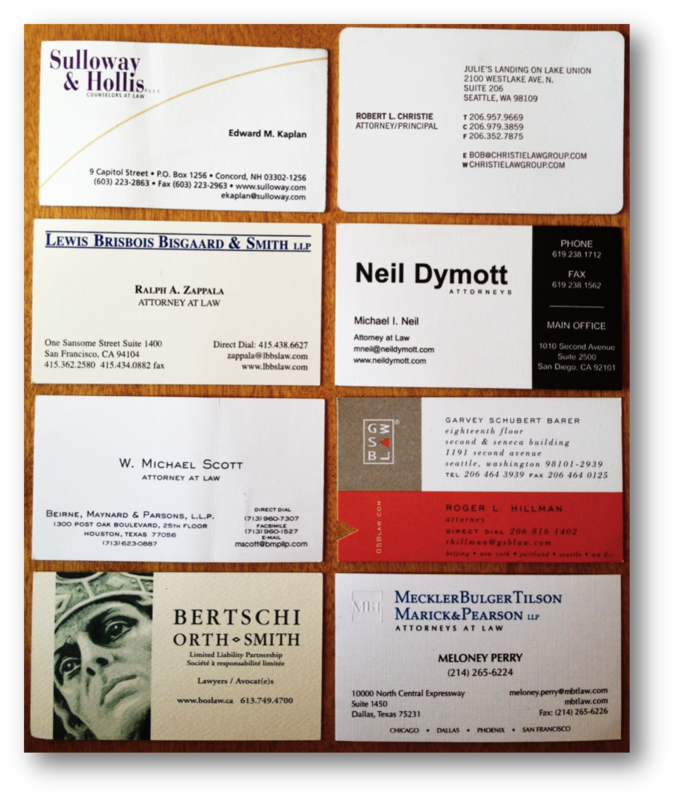 This is why business cards are disproportionately important -- it's something prospects can actually see and feel. It's why we usually recommend to our clients that we engrave their cards and use slightly thicker card stock. It's why we make a big deal about a high-quality logo and layout. Little things can mean a lot when forming a first impression. Last week, I spoke at the national conference of The Federation of Defense & Corporate Counsel. The FCC is a ~1,000-member honorary association of some of the nation's best trial lawyers, in-house lawyers, and litigation managers. These are the types of lawyers who have handled hundreds of big trials. They're a VERY impressive group. I don't think the CIA vets its spies as rigorously as the FDCC does its potential members. Of course, I collected some of the members' business cards for later follow-up. And as always, there were the wide variations in design and message. Above is a quick snapshot of eight of them I just pulled out of my pocket. It's a fairly typical cross section of what you'd generally expect to receive. What do you notice? Which grabs your attention? Which do you like or dislike? Most importantly, where does your card fit in this spectrum? What do you notice? Did you see how Neil Dymott's extra-large sans serif logo jumps out at you? Sulloway & Hollis's typeface is a striking purple with a subtle but unique orange line, while the lawyer's name is juxtaposed in a more-traditional black type. Garvey Schubert Barer's strong orange box grabs your attention, and the unusual triangular notch adds interest. It's not a question of whether any particular design is "better or worse" as much as whether the messages they convey about the firm are what they intend. The piercing gaze of Ottawa's Bertschi Orth Smith's sculpture* commands attention. Although you can't feel it, Bob Christie's card in the top-right corner is both extra thick (practically a cardboard drink coaster) and a full quarter-inch taller than a standard card, and has rounded corners. The all-caps sans serif font completes a truly standout design - while elegant, this card could also come from a design, marketing, or other creative agency. Look at these options, just a random group I pulled out of my pocket, and consider whether the card in your wallet conveys the message you want it to regarding the nature and quality of your practice. 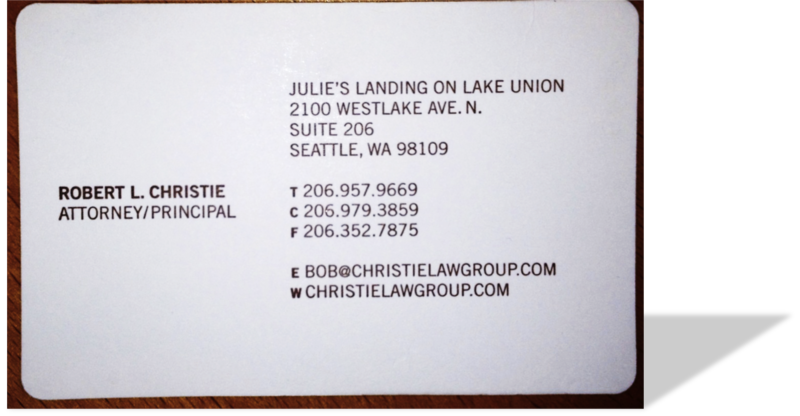 For example, it's easy for me to believe that Bob Christie approaches his cases creatively - the clean design of his business card reinforces that message. Neil Dymott's card is strong and direct -- just like its dynamic founder, Marine General Mike Neil. Bertschi's card makes me want to go visit the website for more information. * "Whether to you our logo recalls Cicero, the Emperor Justinian I, Solomon or a Centurion – to us, it is a single figurehead upon which rests the foundation and principles of our practice." If your firm needs a better strategy, design, or marketing campaign, please give Ross Fishman, CEO of Fishman Marketing a call directly, at +1.847.432.3546, or ross@fishmanmarketing.com. All the images (c) 2012 the referenced firms. Thanks Ross. I think the best part of my card is the reverse side that has our logo. I appreciate your kind comments. And, my son's printing company--Evolution Press of Seattle-- made them, a double bonus.